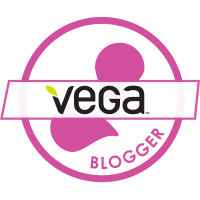 I purchased my bodybugg V3® a few years back, and about six months ago I upgraded to the bodybuggSP® and I can safely say that they were some of the best purchases of my life. 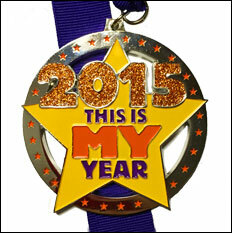 I wear my bodybugg daily and rely on it to help me lose weight. 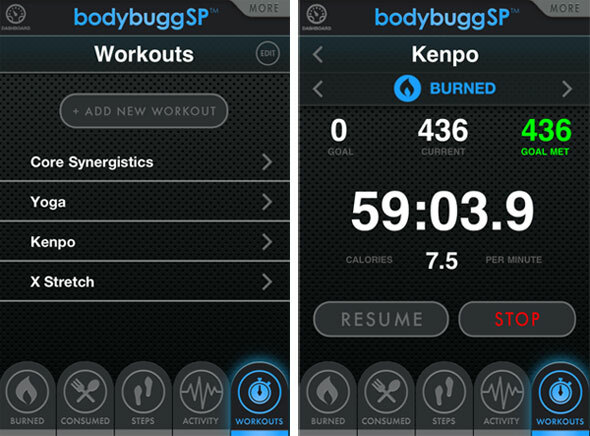 The bodybuggSP® syncs with smartphones and was the reason that I upgraded from the V3. I had the digital wristwatch/clothes clip display (pictured above), but I have all my fitness apps on my iPhone and really wanted the realtime syncing. There have been a lot of complaints from people about the new software because of syncing issues, but bodybugg®’s customer support is the best I’ve ever encountered and they’re so helpful, so I don’t mind a hiccup here and there. They provide support on their Facebook page, through email, and on the phone, and I’ve never encountered an issue they couldn’t help me with. I can’t fault a company that is constantly working to make their product better – and in the time I’ve had the SP, the upgrades to their iPhone software have been awesome with many more coming. The reps are constantly interacting with the users and taking feedback on what we’d like to see, and address issues we’re having with the current technology. For both the V3 and the SP users, all information is logged and uploaded to the MyApex website database, for which users pay an annual fee (see below). The user sets up their goal program – you input your weight and measurements, your goal weight, and then you set your program based when you want to meet your goals. I set my goals to have me lose 1 lb. a week, so my goal everyday is to burn 3,050 calories and eat 2,300 calories. I never get up to the 2,300 consumed, I find myself more in the 1,300-1,800 range depending on the day – so you can definitely come in under, but you should never go below 1,200 calories a day (your body will go into starvation mode and will hold onto what you have, and you won’t lose a thing). The basic measurements that I go by is: 500 deficit daily to lose 1 lb. a week, 1,000 deficit daily to lose 2 lbs. a week – so I’m always shooting for a 1,000 deficit to lose the most that I can. Calories Burned. 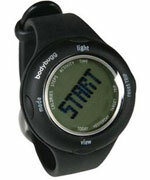 Use a USB cord and upload the info from your bodybugg® every night to see your daily burn. Calories Consumed. This is where you log all of your food. You can be set for 3 meals or 5 meals (I recommend 5 meals – you should eat smaller portions throughout the day). The nutrition window allows you to enter all of the foods you’ve consumed using a variety of measurements (my favorite are grams/ounces – I use a digital food scale). I like to use this tab to plan out all of my set meals for the day, and then I can work in my snacks. Body Measurements. Weekly you can record your weight and measurements – and I like the fact that you can’t record more than once a week (scale hoppers – stop it!). I weigh myself every Friday/Saturday first thing in the morning, and I do my measurements about once a month. Share My Results. You can use this button to share on Facebook/Twitter. I don’t use this option, I prefer to share what I want selectively. Earn Rewards. Bodybugg® now has a referral program (see more about that below). Calories Burned. See what calories are burned throughout the day (the 12am-12pm chart with the blue lines). Use the “Time Selector” to see how many calories were burned during a particular time period (great if you have issues syncing with your smartphone during a workout for the SP or if you forget your digital display for the V3). Nutrition. At a glance, see all your food consumed for that particular day. Calorie Balance. It pretty much just shows you the info at the top of the page – not quite sure why that tab is there. Steps. If you monitor your steps, this will show you where you’re at. Physical Activity. 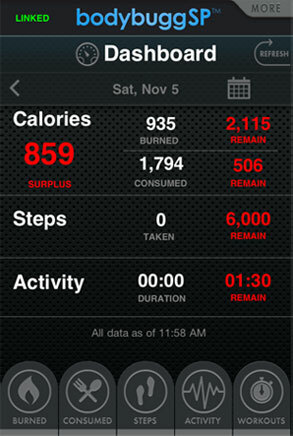 Another chart like the one on the Calories Burned tab that will show you levels of activity. On a less-than-daily basis, you’ll use these tabs. My Results. That is the main page you’re looking at on the screenshot above. My Goals. You’ll see your progress based on your current program. You can also see all progress before your current program (I bought my bugg in January of 2010 – I can see all measurements since the day I registered). My Nutrition Plan. 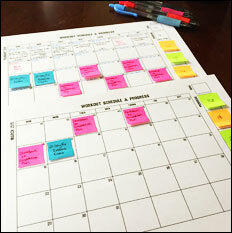 The bodybugg® system gives you a sample meal plan everyday, which you can choose to use or ignore. I’ve glanced at this and used a few, but for the most part I enter in my own food. The nice feature of this tab is planning days – if today is Tuesday and I know exactly what I’m eating going out to eat Thursday and want to plan my meal, I can do that here. My Exercise Plan. I don’t find this tab that useful – you can plan out your workouts here and estimate how many calories you’ll burn, but like a treadmill at the gym, it will never be 100% accurate. My Resources. This tab is filled with information. It contains Knowledge Builders (PDFs of info about all sorts of weight loss/food issues), Custom Foods (foods you enter into the program and custom meals are stored here), Calculators (for food and exercise), Reminders (you can set up two of them…I’ve never used this. They have options such as “take medication,” “eat a meal,” “eat a snack,” etc. ), and Reports (your personal reports). My Info. This tab is also full of information. 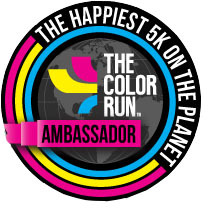 It contains your Goals and Targets, Body Parameters that help dictate your program, Measurements (which again you can see back to the beginning of when you registered your armband), Questionnaires that help dictate your program, and the Register Armband tab in the event that you get a new bugg. And for the SP users, the iPhone has a very nice application as well. You can see my Dashboard for today – I’ve inputted an estimate all of the food I plan on eating today (as I make each meal, I use my digital scale to get correct measurements and adjust), which comes out to 1,794 calories. As of 11:58, I’ve burned 935 calories sitting here at my desk, so I have 859 calories to burn to equal out. My goal, of course, is to burn more than I eat so I like have my consumed number there as a goal to surpass. The application is still limited (as I said, they’re working on adding new features all the time) but I can edit and log food I eat, see my steps, activity, and track my workouts. The workout feature is one of my favorites because I’m obsessed with numbers. I can build custom workouts to track the calories burned in the particular workout – and over time, I can do multiple of the same workout (i.e. if I did yoga once, I can add another session, and then another – same workout, different workout day). So you can see I did P90X Kenpo for 59 minutes, I burned 436 calories (I didn’t set a goal, I just wanted to see how much I burned), and I burned 7.5 calories a minute. If you have to pause the workout for some reason, you can hit “Resume” and continue – another feature I LOVE about the SP that the V3 didn’t have. 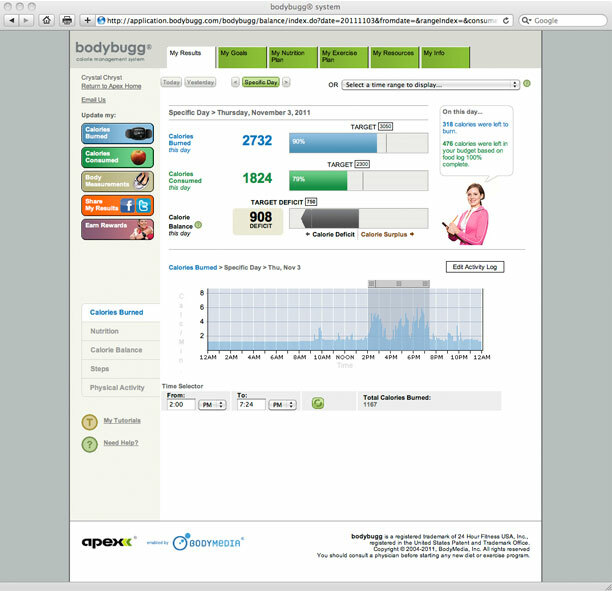 I could talk your ear off if you’d let me about the bodybug® – losing weight is science : calories in vs. calories out. The bodybugg® allows you to get a firm hold on what your body is doing, and I can guarantee you WILL see results. Before getting my bugg, I was super frustrated. I was working out hard and not losing anything – sometimes even gaining. In the first week I had my bugg, I lost 3 lbs…and I was extremely surprised to see how much I was eating. What felt like a good portion to me (see my posts on portion sizes – a must if you’re looking to lose weight) was way more than I should have been eating and canceling out the hard work I had put in during my workout. This system has helped me gain control of my eating habits and activity level by helping me control portions, increase my calorie burn by allowing me to see my numbers. If you use this coupon code when buying your new bugg, you can save $20 off your purchase! With the purchase of a new V3 or SP bodybugg®, you receive a free 6 month subscription to the online program. After that, you can choose to pay $9.95/month, $49.95/6 months, or $79.95/12 months (I recommend the 12 month package – it has the most savings). $79.95 a year may sound like a lot – but if you use your bodybugg® daily, that’s $0.22 a day. Is that really too much to gain control of your life and your health? The most important investments are the ones you make in yourself! Also feel free to contact me if you have any questions about the device or want more information – I would be happy to share what I know.